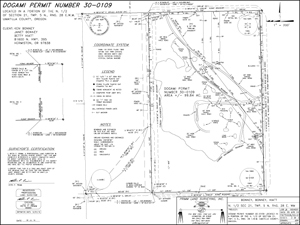 Projects | Primm Land Surveying, Inc. 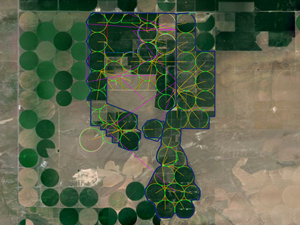 Supplied 3 survey crews to map existing roads and clusters for the design and layout of 50 crop circles to include staking the dead spaces between said crop circles in order for maximum use of said land. 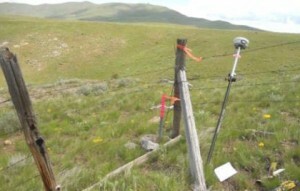 Supplied a 3 person survey crew to recover and or reestablish the original GLO corners on 18 sections and to recover and or reestablish the ROW monuments along a state highway for determining ownership boundaries. Property survey to set the exterior corners and a site survey on a 21 array solar panel farm. Design a 13 lot vacation development project. Stake and plat the 13 lots and road for the construction process. The entire project was initially a boundary line adjustment then 4 separate partitions were created for the new lot configurations. A Department of Geology and Mining Industries survey to meet the criteria and permitting process of a mining operation. The property was described by aliquot parts. Recovered and or reestablished the original GLO corners for 5 sections. Design, monument and plat the new boundary lines. Establish grids work for ground penetrating radar for determining anomalies. Generate 16 digital terrain models for volume calculations. 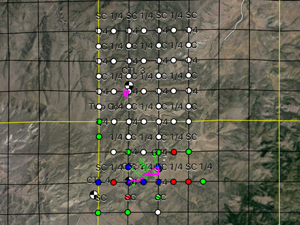 Establish horizontal and vertical locations on 38 monitoring wells as established by DEQ criteria. Surveying for TEWA and ROW. Supplied 3 person crews for the survey tasks that involved setting control points utilizing OPUS to facilitate the staking activities for the temporary extra work areas and the rights of way. The project encompasses the area from Malin, Oregon to Coos Bay, Oregon and comprises of 5 spreads of approximately 230 mile. 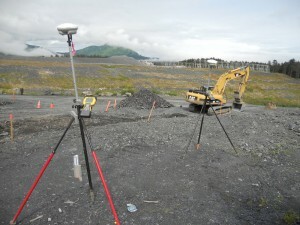 Surveying and grade checking on the extension of the Kodiak land-fill site. 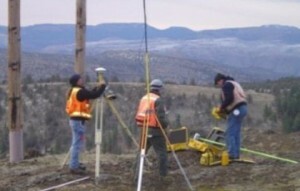 The survey tasks involved setting grade for the equipment operators, calculating volumes and setting slope stakes for the numerous slopes designed for the project. The final task was preparation of an as-built survey of the entire project once construction is completed. Both GPS-RTK and robotic survey methods were utilized on this project. 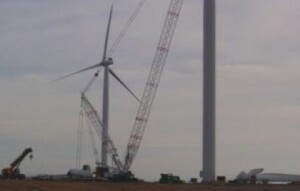 Surveying and consultation on the Butter Creek Turbine Farm. The primary survey task involved recovering original rectangular corners. The second survey task involved mapping of all roads and computing right of ways. The third task was anyalizing deeds and easements. The data gathered was prepared in ALTA survey of the existing site conditions. The project is currently ongoing and it is anticipated that the construction staking will involve laying out 20 turbines, service roads and the transmission line. The final task will be in preparation of an ALTA survey of the entire project once construction is completed. Surveying and consultation on the Barber Turbine Farm. The first survey task involved recovering original rectangular corners. The second survey task involved mapping of all roads and computing right of ways. The third survey task involved mapping a portion of the access route and creating a DTM survey for the design of access roads. The data gathered will ultimately be utilized in preparation of an ALTA survey of the entire project. Surveying and consultation on the Meacham Creek Habitat Restoration. 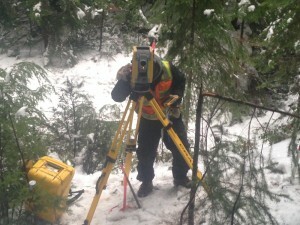 The primary survey task was quality control for the contractor in realigning a portion of Meacham Creek. The centerline of the creek as well as the clearing limits were layed out utilizing RTK GPS procedures. The secondary task was to provide a final DTM as-built of the entire project, this was accomplished by utilizing High Definition Surveying technology (Scanning). 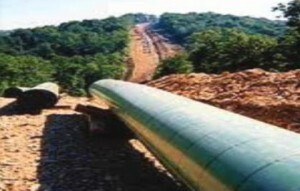 Surveying and consultation on the Ruby Pipeline. 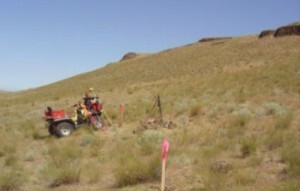 This project was a sub contract agreement to supply one two person survey crew on the section known as spread 3 from Tremonton, UT to Wells, NV. 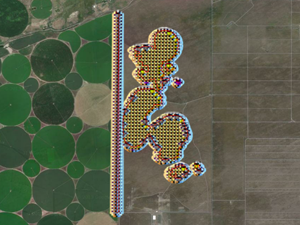 The surveying entailed establishing primary and secondary control utilizing Online Positioning User Service (OPUS), each control point was occupied a minimum of 4 hours, coordinate systems utilized was UTM 12 for Utah and UTM 11 for Nevada. The surveying also entailed the lay out of the centerline, left and right temporary work space and left and right additional temporary work space at 200 foot stationing. There were several reroutes due to terrain, data was collected with RTK GNSS in these sections and delivered to the engineers. Client: Brown & Kysar, Inc.
Surveying and consultation on the Columbia Power transmission line upgrades. The project was divided into two segments known as the Fossil to Service creek segment at 25 miles and the Pilot Rock to Ukiah segment at 26 miles. 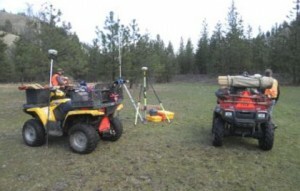 Initial topography was collected utilizing LIDAR aerial survey, upon completion of the LIDAR aerial survey the ground surveying of these 2 segments consisted of preliminary and final field staking. Preliminary staking entailed establishing horizontal & vertical control in Oregon North Zone State Plane Coordinates NAD 83/91 within each corridor, staking the center of each pole structure and collecting topography where engineering was needed, the final staking entailed revising the location of each pole structure based on engineering, staking the guys, anchors and offsets for each pole and writing legal description where easements where needed. Surveying and consultation on the Echo Turbine Farm. The initial surveying task was to map and cross section 18 miles of state highway right of way for the engineering and design of the proposed transmission line. The second surveying task was the construction surveying which predominately entailed staking in 37 turbines, staking in 37 crane pads, staking in all service roads on the project site and staking in the onsite substation. 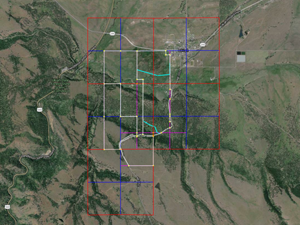 The third surveying task was to create legal descriptions of the entire project boundaries as well as the sub easements, prior to creating the legal descriptions all rectangular corners had to be either found and/or calculated. The forth surveying task was to perform an ALTA survey. 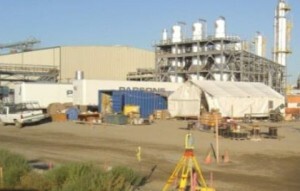 Surveying and consultation on the Pacific Ethanol Plant. The consultation under this contract was how to best execute the staking needs and time frame in order to keep the project on schedule. The initial surveying task was to stake out all underground utilities to include water, sewer & electric. In addition we staked out all building pads, storm swales and provided a complete as-built survey of the facility. The second survey task was to review the title report and perform an ALTA survey. 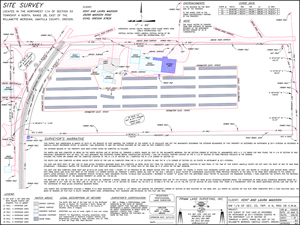 Primm Land Surveying, Inc. met the professional surveying needs of three separate contractors on this project. Surveying and consultation on the Hermiston Aquatic Center. 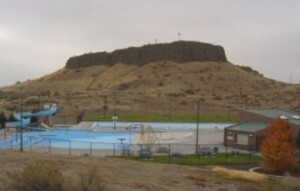 The Hermiston Outdoor Aquatic Center was contracted with Apollo Construction. The consultation was to confer with the general contractor how to best accomplish the construction layout to meet the needs of the different crafts on site. The surveying aspect entailed the layout of both the men’s and the women’s changing rooms, layout the large pool as well as the multi-use pool, layout all grade stakes for all parking areas, and the layout of curbs and gutters throughout the project site. Surveying and consultation on the Aspens Phase one. 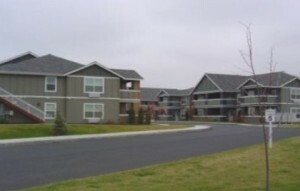 Phase one consisted of 48 rental units in 8 buildings. The surveying on phase one was divided into two sections, public and private. 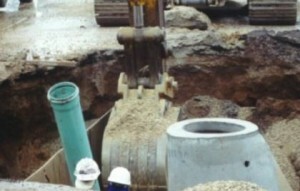 The public portion consisted of a public road, sewer lines with 7 manholes, and water lines. The private portion consisted of 8 buildings, access roads, 5 parking lots, sewer lines with 3 manholes, water lines, and storm lines with 14 catch basins, 14 outfalls and 8 infiltration swells. Upon completion of the building concrete slabs a final as built survey was performed with dimensions to adjacent property boundaries. Client: Ivan Anderholm, City of Hermiston. Surveying and consultation on the Mckenzie Park Plaza. 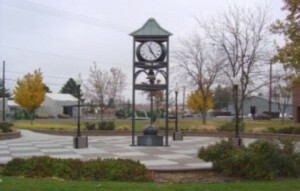 Consulted with the engineer on the design of the facility and how it best suits the existing conditions of the site, this was accomplished by mapping the existing conditions of the 4 acre City of Hermiston McKenzie Park Plaza, this survey was in turn used to create a new design of the park to include new walkways, restrooms, gazebo, cook shack and a bell tower dedicated during the centennial celebrations for the City of Hermiston in July 2007. The Construction layout encompassed all curbs, walkways, restrooms and gazebo. 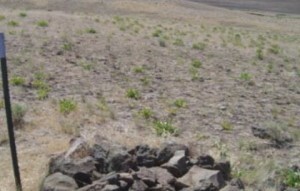 Cadastral Surveying within Umatilla County. Contracted with Umatilla County to recover and or reestablish the original GLO corners in 5 separate townships. The survey work entailed reviewing the original GLO field notes and any record of surveys within the townships. Recovering the original corners and if they are not recovered then they were reestablished based on the BLM manual of survey instructions. Each corner recovered or reestablished was witnessed in the four quadrants and a condition report was generated. The final deliverables to the client was a plat of the entire township along with condition reports. Surveying and consultation on the Irrigon Sewer Conversion Project. The Irrigon sewer conversion project was a sewer construction project of installing 31306 linear feet of new sewer lines, 65 new manholes and a highway boring within the city limits of Irrigon, Oregon. The surveying tasks involved staking in the 31306 linear feet of new sewer line in order to keep the four crews of the general contractor on schedule. Quality control was provided in order for the general contractor to meet the construction criteria as established by the civil engineer Once the sewer line was installed, a complete as-built of the project was performed along with red line drawings in AutoCadd. The final deliverables to the client was the as-built drawings in AutoCadd format. Surveying and consultation on the Heppner Water Lines Project. 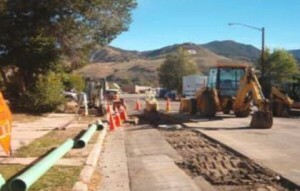 The Heppner Water Line project was a water line construction project of installing 25875 linear feet of new water lines, 14 new fire hydrants, 63 connects, 113 valves and bridge crossing within the city limits of Heppner, Oregon. The surveying tasks involved the construction staking of the 25875 linear feet of new water line and 14 fire hydrants for the general contractor. 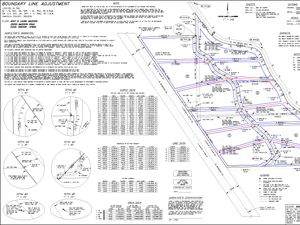 Quality control was provided by Primm Land Surveying, Inc. to ensure the water lines were constructed within the road rights of ways as designed by the engineer. 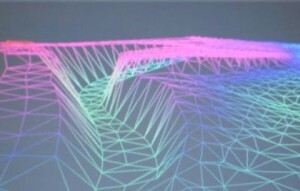 Digital Terrain Models. Digital Terrain Model (DTM) Surveys are made to digitally represent the topography or terrain of the existing ground along with any improvements, they are typically performed prior to construction projects by utilizing either RTK GPS methods or by scanning techniques. Once construction is complete a DTM Survey can be generated for final as-built drawings.